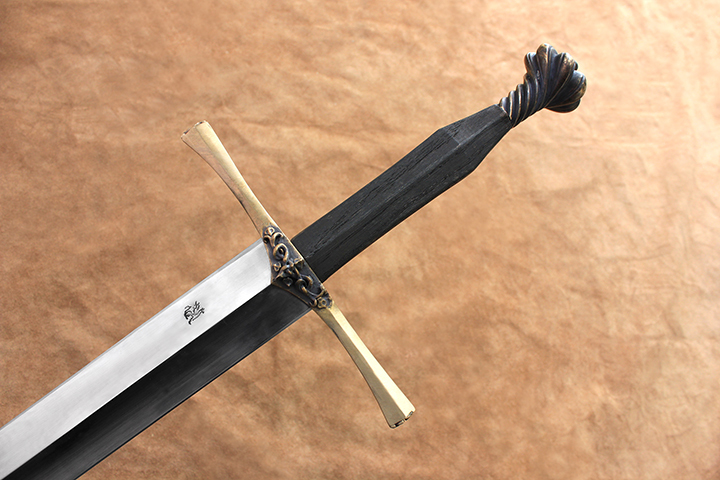 We are pleased to present our new arming sword, the Sovereign. 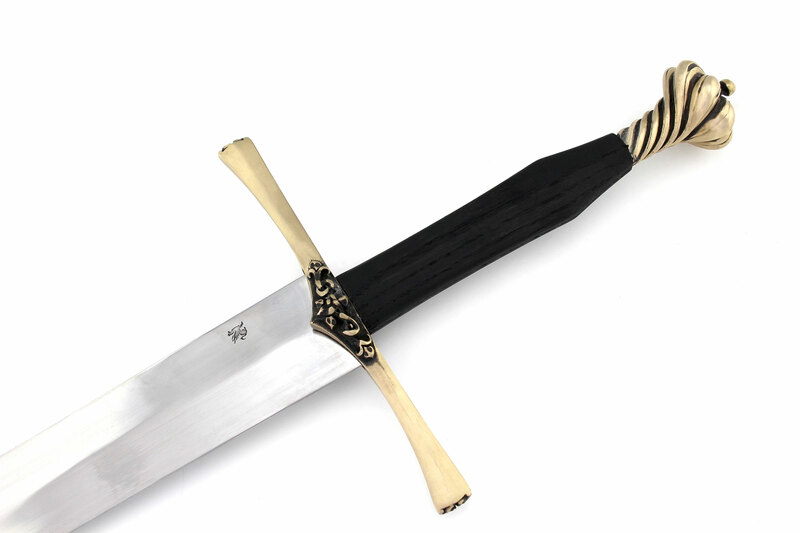 Taking inspiration from both Medieval French and German swords, the Sovereign is a late 15th century style arming sword with an Oakeshott type XVIII blade. The guard is decorated with a floral French motif, while the pommel is directly cast from a 15th century Katzbalger in the collection of the Sovereign co designer, Eyal Azerad. Hand forged, the Sovereign’s blade is made from 5160 steel and deferentially heat treated to a Rockwell of 53 at the core and 60 at the cutting edge, giving the sword astounding toughness and flexibility. Light, agile, durable, and sturdy, this is an arming sword that any Medieval soldier would have been proud to call his own. As the 15th century drew to a close, the nature of the battlefield – and the Renaissance Sword – was changing. The rise of towns and cities across Europe created the infrastructure required to produce blades in greater quality and numbers. No longer affordable only by the nobility, the sword became an infantry weapon, provided by the quartermaster and used by the common soldier on the battlefield. Likewise, advances in armouring technology created a new battlefield where adaptability mattered at least as much as striking power. With the sword now used by both mounted knight and foot soldier, the blade had to be able to pierce the plate armour of the knight as well as a strike against the variety of armor used by the infantry. The blade evolved to have a strong, reinforced tip for thrusting while retaining an edge built for cutting. Known as a cut-and-thrust sword, this flexibility was often the difference between life and death in the heat of combat, regardless of if its bearer was an infantryman or a mounted knight. 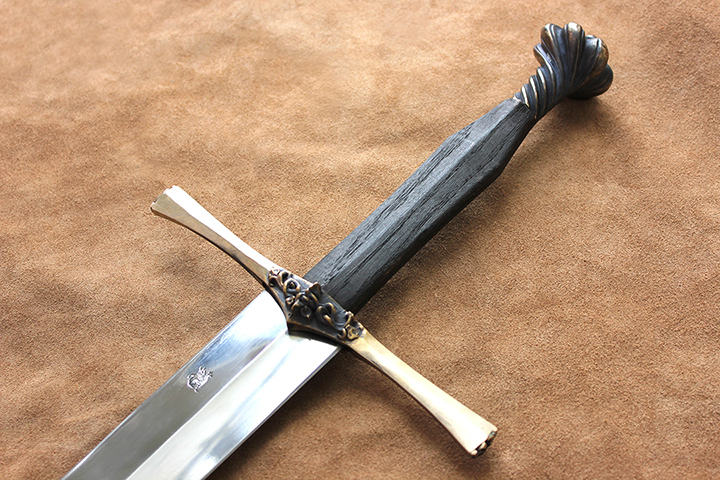 Co-designed by Darksword Armory and American bladesmith Bruce Brookhart. Taking inspiration from both Medieval French and German Swords, the Renaissance is a late 15th-century style arming sword with an Oakeshott type XVIII blade. The guard is decorated with a floral French motif while the ‘Writhen’ pommel is cast directly from a 15th century Katzbalger in the collection of the Renaissance co-designer, Eyal Azerad. Hand forged, the Renaissance’s blade is made from 5160 steel and deferentially heat treated to a Rockwell of 53 at the core and 60 at the cutting edge, giving this medieval sword astounding toughness and flexibility. 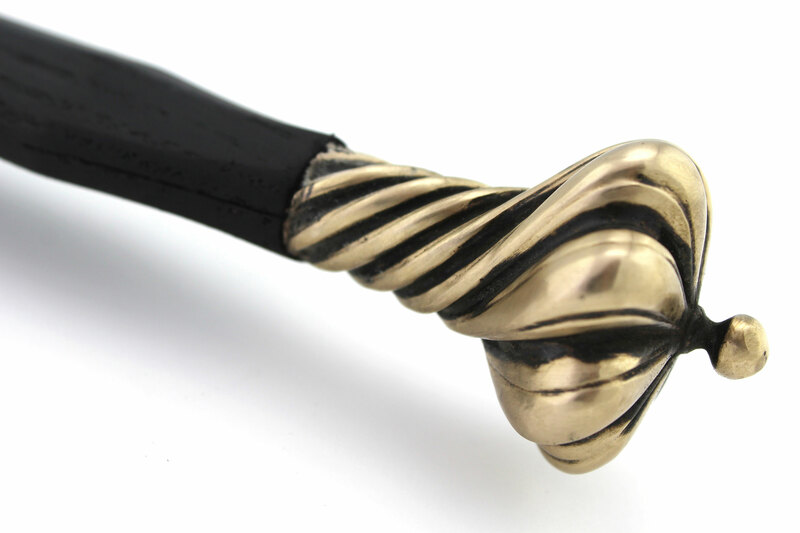 The Guard and pommel are solid Bronze, crowned with a slightly diamond shaped Oak grip. Light, agile, durable, and sturdy, this is an arming sword that any Medieval soldier would have been proud to call his own. Bruce Brookhart is an American bladesmith and weapon designer. Bruce worked closely with Hank Reinhardt for over 15 years and consulted Ewart Oakeshott for over a decade. The sovereign is one of those swords that the entire staff was excited to work on. While using an historical example of the arming sword blade, Eyal, owner of Darksword Armory, worked closely with our designer, Terry, to create a beautifully clean, yet sophisticated sword with an equally beautiful guard and scent stopper pommel. 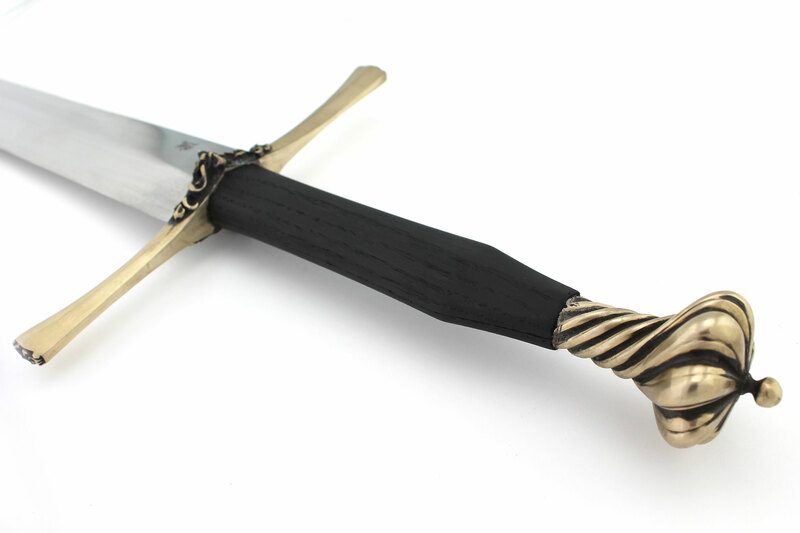 Our vision for this arming sword, was to create a medieval weapon worthy of the aristocratic echelon of society. We wanted to create a smooth or clean design while injecting the fittings with elegant details, prevalent during the 14th to the 16th centuries. While great importance was bequeathed to the elegance and the symmetry of the fittings, close attention was set on the blade’s performance and balance. We felt that a simple diamond blade would not do justice to the vision we had for the Sovereign. We decided that a deep hollow ground diamond blade had to be fitted on this sword. During the 15th century, the arming sword became the primary medieval weapon of the aristocracy. 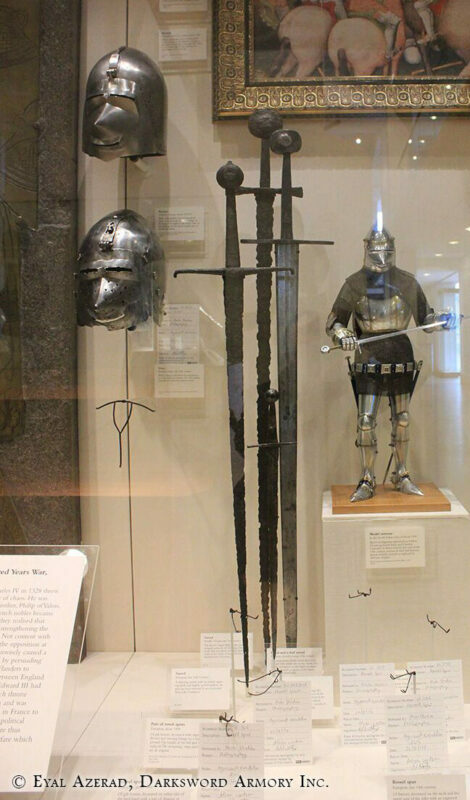 As armor became increasingly layered, the arming sword because the medieval weapon of choice for both the mounted knight as well as the foot soldier of considerable status. Shorter than longswords, the Arming sword was perfect for the onslaught of close quarter combat. It was light, well balanced and had a sharp tapper and stiff tip, specifically designed to puncture heavy armor. The Arming sword proved to be a devastating weapon again the heavy plated armor of the time. The heavily tapered blade gave the sword devastating stabbing force against plated armor, while retaining it’s destructive cutting edge. The sword came to be known as the ‘Arming swords’ because it became the weapon of choice for English, French and German forces. We examined numerous type XV swords during our visits to the British museum in London and the Royal armouries, in Leeds. All examples presenting similarities in regards to blade type, varying from flat diamond shape (such as the example in the Wallace collection inventory 22A), to hollow ground diamond blades in the Royal Armoury Museum in Leeds. 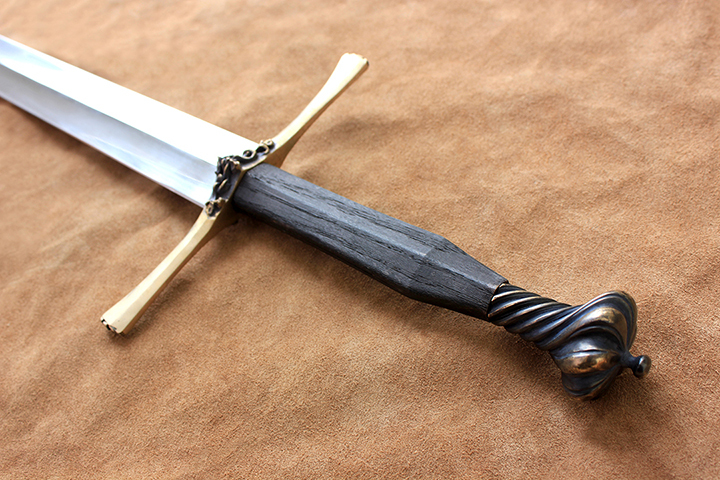 Classified as a type XV by Ewart Okeshott the Sovereign arming sword is a one handed medieval weapon. While mainly popular during the 14th and 15th C, some sources suggest that type XV swords made their appearance as early as the latter part of the 13th century. These arming swords however, were made with flattened diamond blades rather than hollow ground. 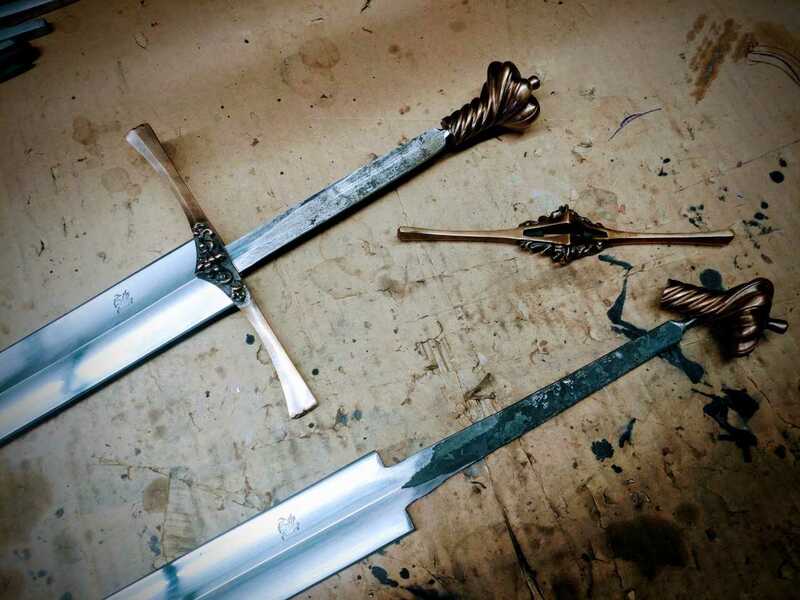 According to Ewart Oakeshott, the heavily grounded diamond cross sectional blades of the arming swords began during the second quarter of the 15th century. The Sovereign’s perfect balance combined with deadly cutting and thrusting capabilities make it a perfect sword for both beginner and advanced students of the sword. Being perfectly balanced and relatively short, the Sovereign sword has become a favorite among beginners ‘of the sword’ seeking to perfect their form. The thick spine of the blade provides good stiffness. 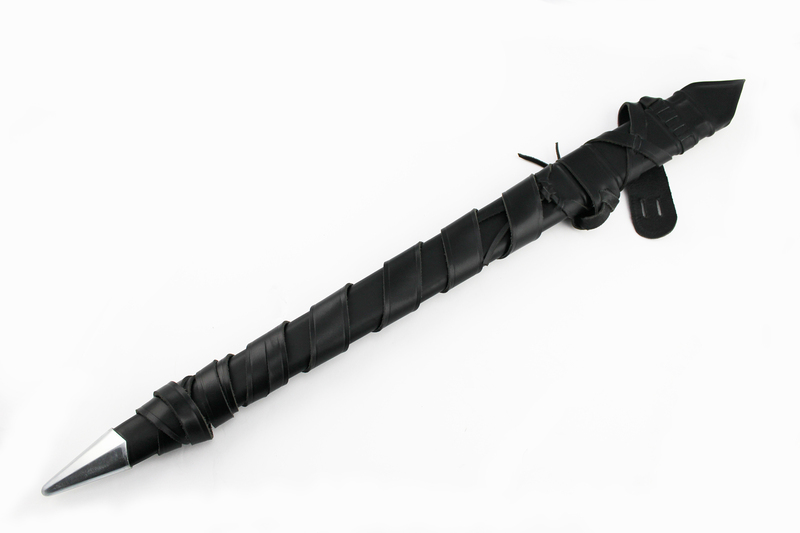 This makes the Sovereign sword manageable and powerful, with excellent thrusting ability. Being an arming sword with superb balance, this one handed medieval weapon gives little resistance. It handles very well with one hand use, permitting the use of a shield, for students of mode I-33, on the opposite hand. 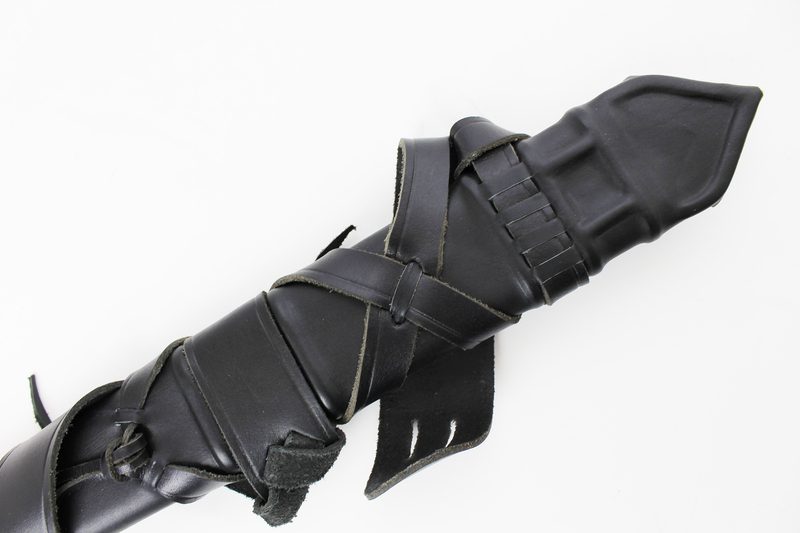 While primarily a thrusting weapon, the stiff blade of the arming sword makes it an excellent cutter against any appropriate target. The sword’s stiff blade and sharp edge will penetrate or cut through most targets with little effort. The Sovereign Arming sword is not only a beautiful medieval sword, it is truly an exceptionally well balanced medieval weapon. Easily wieldable and very responsive, it provides both novice and experienced users a very good performing battle ready weapon which will easily cut and thrust through most targets set against it. “the four faces of the blade, instead of being flat or very gently hollowed, are so strongly hollowed out that a newaly flad blade with a powerful upstanding mid-rib results….surviving examples seem not to date earlier than 1425” (Ewart Oakeshott, “The Sword in the Age of Chivalry” p, 59). 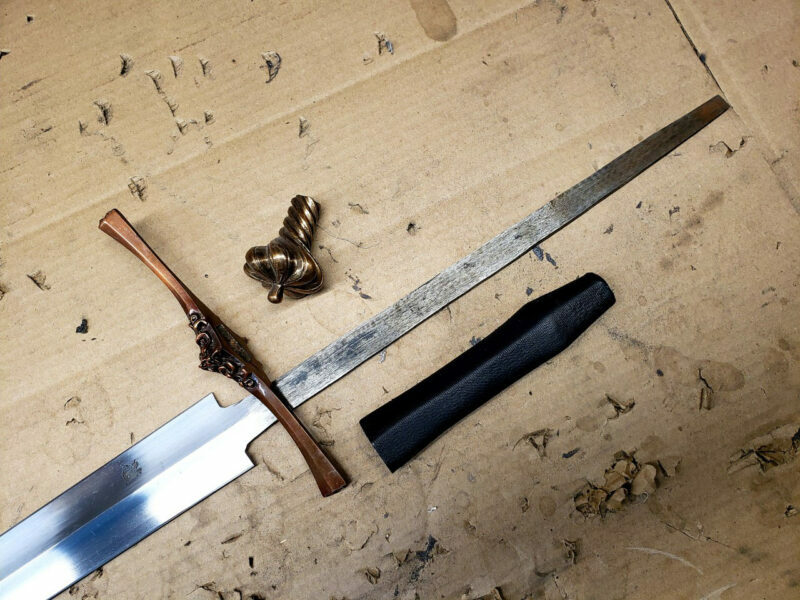 During this period, sword geometry evolved to balance thrusting with the cutting geometry of previous periods. It was during this period that blade geometry began morphing more quickly as a response to the technological advances of the full plate armor of the medieval knights. As such, we designed the sword with a deep hollow ground blade rather than a flat diamond cross sectional one. The blade is stiff and has a four-sided triangle-shape profile, with a diamond cross section, acute point and no fuller. Such blades were popular from the 15th century among the nobility for their resilience, light weight, dexterity and devastating thrusting capabilities. Due to their light weight and potent thrusting abilities, this powerful and effective sword became the prevailing weapon of the 15th C.
Arming swords were exclusively owned by the elite aristocracy (The medieval knight of the time). That said however, arming sword with flattened diamond blades were also used by the foot soldiers. Their use was so common among the knights of the German, French and English forces that it came to be known as the quintessential sword of the medieval knight of the 14th and 15th century. Being specifically designed for close quarter combat, we wanted the Sovereign to have superb handling capabilities, an exceptional response and a very good PoB (point of balance). 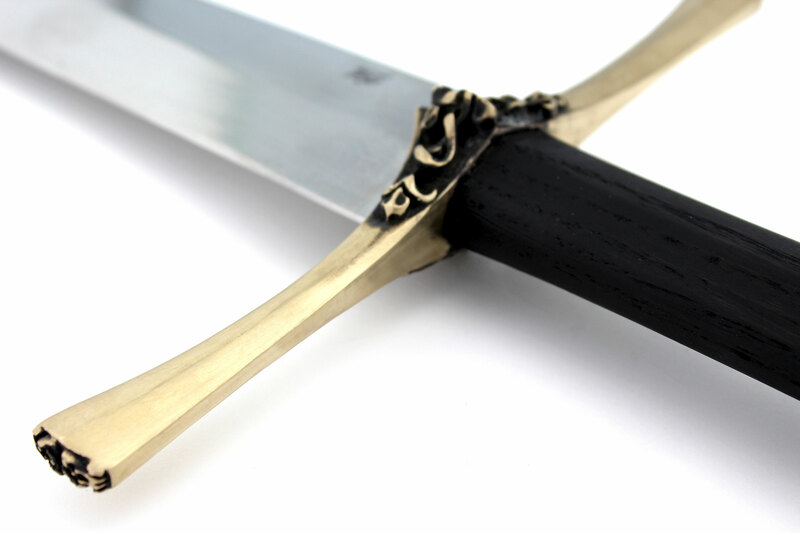 Paying considerable attention to the PoB, the Sovereign is an exceptionally easy sword to handle for both experienced and amateur sword enthusiasts. The sword is a very responsive sword that feels ‘alive’ and light in the hand. Easily wieldable even in novice hands, the Sovereign sword’s characteristics make it a medieval weapon of choice for all collectors. The sword is perfectly balance for swift movement and powerful delivery in both cut and thrust. 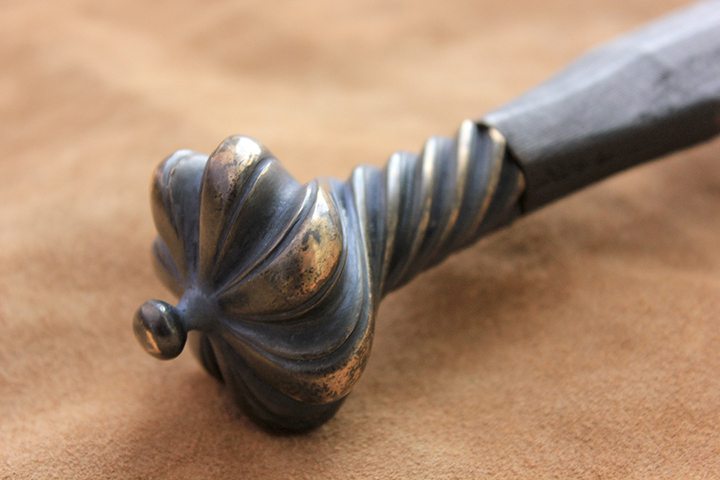 While making a sword made to fit the aristocrats of medieval society, the fittings had to be cast in a worthy material. 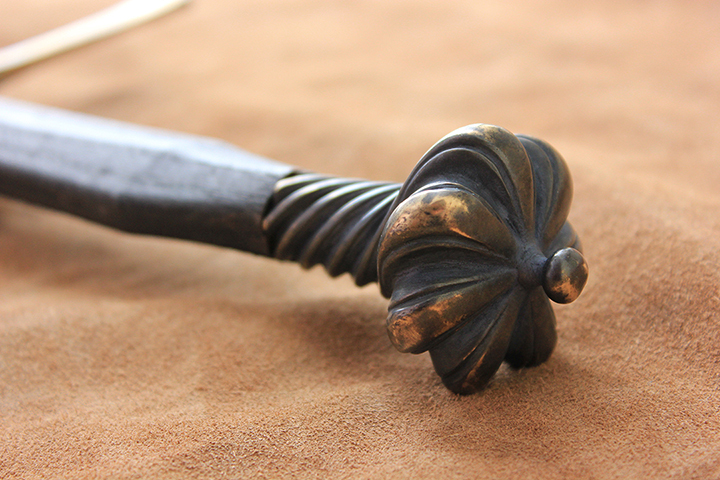 We therefore decided to cast the pommel and guard with bronze, with an antique ‘pattina’. Bonze pellets are carefully placed in a crucible. The bronze pellets are melted and air forced into the wax molds of the Sovereign. I purchased the Sovereign a couple of months back, and I wanted to make sure any review I wrote would not be biased by the blissful feeling of a new purchase. Now that I have had time to not only perform some test cuts, but also get used to it on display in my home, I must say that I am exceedingly satisfied with my purchase. The Sovereign’s design manages to accomplish the task I have always sought but seldom found: being historically plausible yet uniquely designed. Aesthetically speaking, this sword is striking. 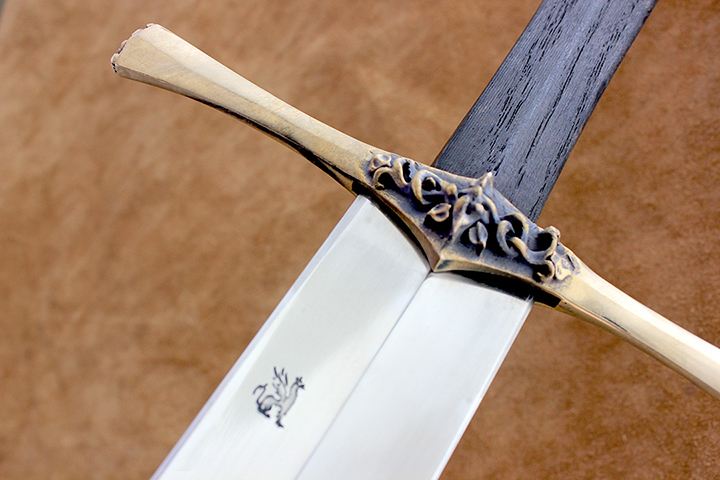 It has received numerous complements on its combination of class and functionality, even from those with no previous interest in medieval swords. My girlfriend’s description was “masculine yet elegant”. Many original designs end up gaudy, while many direct historical replicas lack personality. The Sovereign has personality, yet doesn’t push its individuality so far as to become overpowering. This sword has a subtle and respectable yet highly artistic design. Design is nothing without proper construction, however, and so cutting tests were done to see how this beauty performed. The construction felt solid before, during, and after the cuts. The blade, while incredibly light and quick, still manages to instill confidence and give the feel of an intimidating and forceful tool for combat. As for the team at Darksword, I couldn’t be more satisfied with their service. I exchanged emails, curious about the timeline for construction/delivery, and they kept a running dialogue with me the entire time. Although it was my first purchase from the company, I felt that my individual needs and concerns were being addressed by people who legitimately care about their products and customers. I am not used to that. 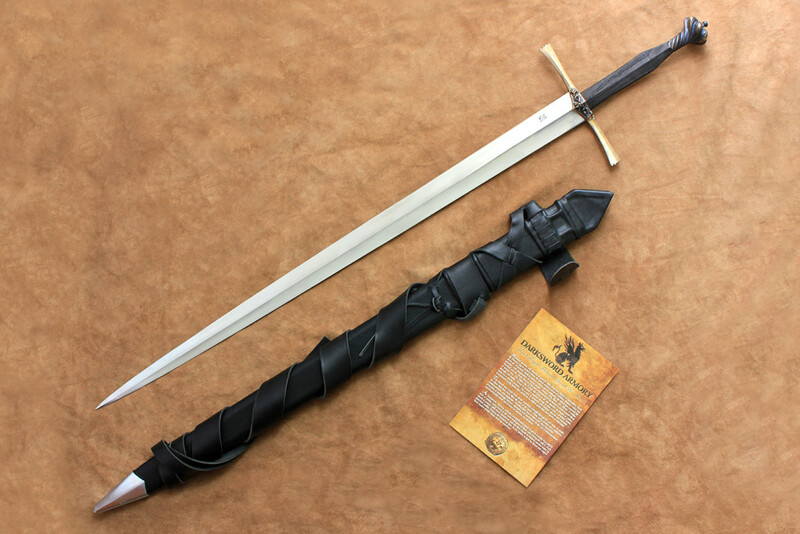 The only downside to this purchase is that I now find myself browsing the Darksword Armory site looking for possible future purchases. The Sovereign was bought for a very specific and personal reason, and I hadn’t planned on starting a collection, but such is life.